Improve acoustics without the need to change existing installations such as ventilation, cables, lamps, etc. LÄTT is manufactured in two standard sizes. The absorbents are 50 mm thick for good sound absorption. The core material is Rockwool which is covered with Acoustic Nonwoven to eliminate fibre deposition. 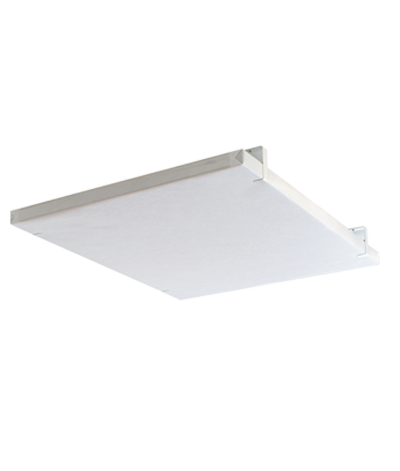 LÄTT is mounted in the ceiling leaving other installations such as lighting and ventilation undisturbed. LÄTT is delivered fully dressed in black or white Acoustic Nonwoven. The clamps are available in two models, with or without an air gap between the absorbent and the ceiling. Air gap is 50 mm. Become a registerd user and get access to usefull tools like reverberation time calculation and graph view etc. © 2013 Acousticfacts.com. All rights reserved. Calculate room reverberation time in a virtual room using products on the site. Compare products on the site with each other. Get access to our online acoustic experts. Select the newsletters you want to subscribe to. The software on this site calculates reverberation time for sufficiently diffuse rooms and with the chosen furniture. The calculations are based on the method described in EN 12354-6:2004, and the evaluations are based on SS 25268:2007. Acoustic Facts is not responsible for any direct or indirect damage that may result through use of this software. Please enter the email address that you used when creating your account. An email will be sent to that address with further instructions.